The e-book service is known as skoob . It offer the works of Singapore writers, study guides and educational books for local primary and secondary school students. You can download books on up to five devices on one account. Skoob is available for free on Apple iTunes Store  and Android Marketplace . 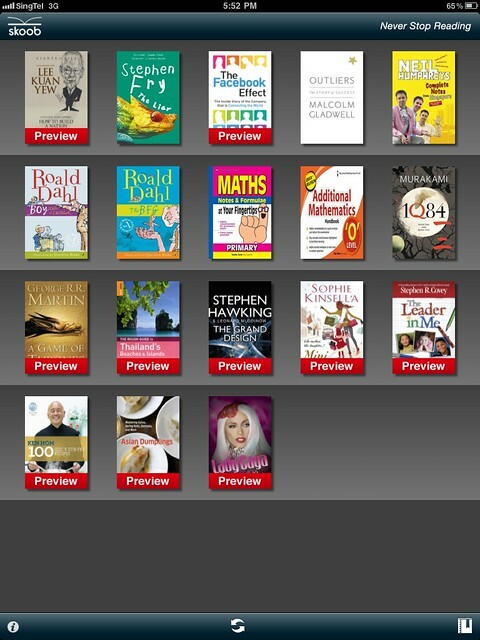 You can also use any browser to view them online via skoob  or load the e-books into Adobe Digital Editions . Skoob offers titles from leading publishers, including the world’s six major publishing houses: Random House, Penguin, HarperCollins, Hachette Book Group, Simon and Schuster and Macmillan. The service carries local titles, study guides and educational books from: Popular, Marshall Cavendish, Cengage Learning, Asiapac, Flame of the Forest, McGraw Hill, Sunbear, Monsoon, Singapore Asia Publishers (SAP) and Janus Education. For more information on skoob, and to download the app, please visit skoob.com.sg .